Alvor Car Hire Algarve | Quality Algarve Car Hire in Alvor and Faro airport and all over Algarve, Portugal. With a decade of experience in the Car Hire market in the Algarve we have a good selection of quality cars, from the economic 3 doors to the family people carriers. We give a personalised delivery service carried out by professional friendly staff with several years in the Algarve Car Hire business. We are based in Alvor and Faro and besides Faro airport we also deliver anywhere in the Algarve depending on our customers request, including Vilamoura, Albufeira, Lagos, Praia da Luz, Praia da Rocha, Carvoeiro and more. 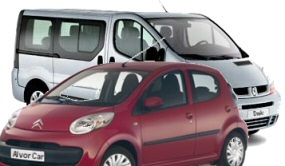 Just let us know where you want your Car Hire delivered when making the Algarve Car booking. At Faro airport our friendly staff will wait your flight and make sure to provide a fast delivery at Faro Airport car park, without queues or transport bus to outside offices. To help you better explore the Algarve without getting lost we can provide your rental car with a modern english speaking Satelite Navigation System. We run regular special promotions for Algarve Car Hire on some ocasions. Be aware and save. Make a quotation search regularly using our search facility above even if it is not for the current period. The search result will show you the promotion for the period you are looking for so you can take advantage of discounted car rentals. Looking for Worldwide Car Hire?